Newtownpery in Limerick was a Georgian city and the flues these in Georgian Buildings chimneys were quite large, and although it was recognised at the time that these flues would need cleaning the tools were not created to facilitate this job. 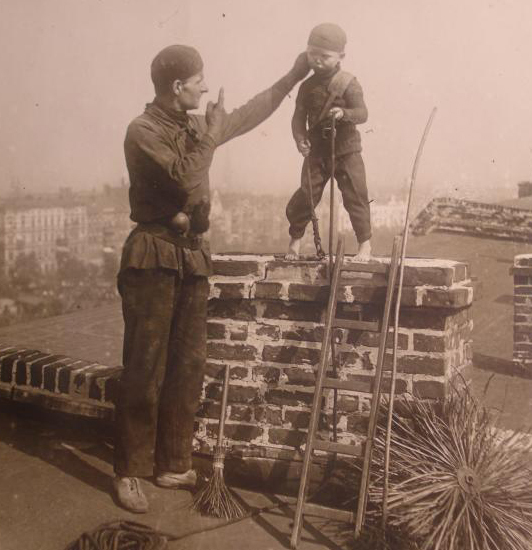 So young children were used to climb up the flues to scrap and brush the soot and tar from the inside of the chimney. It was common in the 18th and early 19th century for a Master Sweeps take in young children from the streets and turn them into apprentices. These were usually small boys between the ages of 5 and 10. The chimney sweep master taught them the trade while being responsible for feeding, clothing, and housing them. Working conditions for the climbing boys was harsh and many suffered from job related ailments. Casualties were also frequent as many boys were maimed or killed from falling or from being badly burned. There are recorded instances where these climbing boys choked and suffocated to death from inhaling the chimney dust or from getting stuck in the narrow and convoluted chimney flues. The following is one such sad tale from Limerick in 1846, it is interesting to see how the various newspapers of the time report the event. On Saturday night, a little boy, of the name of Michael O’Brien, a sweep, was suffocated in the chimney of a house in Patrick-street, down which he had been sent by his master for the purpose of cleaning it, in consequence of the soot having taken fire in the course of that day. A long time having passed without O’Brien making his appearance, and although frequently called to, having made no reply, an opening was made into the flue, and the poor fellow was found quite dead. When pulled down from the place where his body was discovered by Sub-constable Nash, it was found to be in a frightful state, the skin being much burned and disfigured. An inquest was held on the body, at Barrington’s Hospital, on Sunday, and a verdict of accidental death returned. Thomas Costelloe, of Garryowen, labourer, deposed, that he was in Mr. Matthew Ryan’s house, in Patrick street, on Saturday evening, where he saw two sweeps, Michael Sullivan (master) and Michael O’Brien (apprentice) aged eight years; was present when Sullivan compelled the climbing boy to ascend the chimney ; shortly after being sent up, the boy cried out, he was burning, and Sullivan called him down ; Sullivan then brought the boy up to the top of the house, and directed him to go down through the chimney, which he did ; in about two hours after, witness saw Michael O’Brien taken out of the chimney dead ; deceased had objected to go down the chimney, upon which Sullivan seized him by the arms, and forced him up stairs ; heard Mr. Ryan desire Sullivan not to send the boy up the chimney, if there was any danger. Catherine Ryan, servant in the house, sworn – I heard Sullivan desire the little boy go up Mr. Ryan’s chimney, for the purpose of cleaning it ; in about 15 minutes after, I heard the boy cry in the flue, and say he was burning ; he came down the chimney, and Sullivan caught hold of him by the leg, and pulled him into the grate of the fire-place ; he beat the boy with a leather belt so severely, that the little fellow threw himself on his knees, and said, “I will go to the top of the house, and come down through the chimney;” I saw Sullivan seize him by the arm, and carry him up stairs to the top of the house; the boy was subsequently taken out of the chimney dead. The jury returned the following verdict:- “Michael O’Brien came by his death from the effects of heat and suffocation, in consequence of having been forced to descend a chimney in Mr. Ryan’s house, Patrick street, by Michael Sullivan”. The monster, who was the cause of the boy’s death, has absconded. A circumstance attended with melancholy and fatal consequences, took place in Limerick on Saturday last. About four o’clock in the evening, the chimney of Mr. Ryan’s house, No. 10, Patrick-street, was discovered on fire, large volumes of smoke and flames been seen issuing forth. An hour after this, a poor little boy, about ten years of age, an apprentice to a sweep, was sent down from the top through the chimney, by his inhuman master. The usual method is for to ascend, but the flue in the lowr part was still so hot, that it was quite impossible; the poor child was therefore forced down from the top. About three hours after going in, his body tumbled down the fire place in the shop, a disfigured, blackened, and burned corpse. The circumstances of this case are such as to call for the most strict investigation on the part of the public authorities of Limerick, and we are sure that whoever, or whatever, the author of this terrible deed is, that justice will be administered, and that humanity will be protected for the future from a like barbarous occurrence. Sullivan is the name of the wretched seep who was accessory to the death of his apprentice in Limerick. The miserable inhumane miscreant has decamped! Michael Sullivan, the master sweep, who, by threats and violence, compelled Michael O’Brien, a climbing apprentice boy, to descend a chimney in Patrick street, Limerick, the flue of which had been on fire last month, and when the boy died in the chimney from the effects of heat and suffocation , has been arrested by the police, at Farney bridge, near Thurles, on the verdict of the Coroner’s jury. The most perfect tranquillity prevails here, and only in some instances interrupted by the appearance of guilty persons taking shelter here, when flying from the disturbed districts, but these are soon picked up and handed over to justice, to atone for their misdeeds by our intelligent and efficient Sub-Inspector, Mr. McMahon, aided by his active Head Constable Foot …. on the 4th inst. They succeeded in picking up Michael Sullivan, a master sweep, at Bunkershill, charged with the murder of a boy named Brien, who, in April last, in the city of Limerick, was inhumanly forced into a chimney then on fire, by which he lost his life. Michael Sullivan, a master seep, was indited for the wilful murder of a young lad named Michael O’Brien, on the 25th of April last, in Patrick Street, by sending him up a chimney in which he was suffocated. (This circumstances is fresh in the recollection of our readers). Guilty of manslaughter not sentenced. Michael Sullivan, sweep, was indicted for having, on the 25th day of April last, compelled Michael O’Brien, a boy, to descend a chimney in Patrick street in which he had been suffocated. Mr. Barry, who had been assigned as counsel to the prisoner by his lordship, said he would withdraw the plea of not guilty, and plead guilty, but the prisoner having been given in charge, his lordship said he had no jurisdiction. Matthew Ryan to Mr. Barreton – Recollects the 25th of April last, Sullivan went up to the top of his house in Patrick-street, and compelled the deceased to descend chimney, who was afterwards found dead ; the chimney was the same day on fire a short time before ; water had been poured through the chimney before the boy descended. The case here closed, and a verdict of manslaughter was returned with the concurrence of counsel for the prisoner. Eighteen years later in 1864 the “Chimney Sweepers Regulation Act” was introduced to Ireland this outlawed the use of children under the age of 10 as chimney sweeps, with a penalty of gaol for offenders.